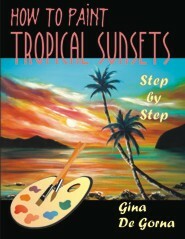 How to Paint Tropical Sunsets is the first and only instructional book about the art of painting tropical sunsets. The book will be of interest to art enthusiasts of all ages. No previous painting experience is required. A list of all necessary materials is included, along with detailed step-by-step instructions and plenty of painting tips, beautiful samples, and colorful references. How to Paint Tropical Sunsets is a great tool for art therapy, art classes, self enjoyment, and stress relief.